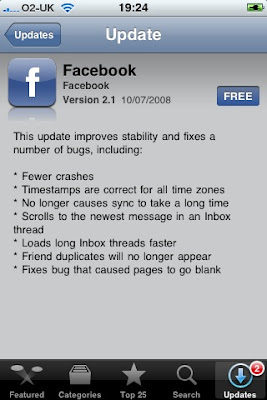 Facebook has rolled out an update for their very popular iPhone App. It's a simple deal; less crashes, less bugs and more speed. A good way to see just how good the Facebook App is to use it to view pictures from Facebook albums and compare that speed to the speed that I Can Haz Cheezburger manages. The future of the iPhone app very much depends on the direction Facebook takes. There's no way to flex Facebook Contect through the app yet. More significantly the app is very much about browsing Facebook and less about the activity stream rival it could morph into to challenge Friendfeed.